Another jump in time has occurred between this tale and the last, Klein having already succeeding in what she set out to do by ensuring the Nazis won World War II. The resulting presence in the twenty-first century of the Galactic Reich aggressively seeking to expand its domain is a tremendously intriguing plot device and certainly helps to give a much greater scope to events than the rather claustrophobic settings of the moonbase would otherwise suggest, but it’s the unique use of the Doctor here that truly shines and takes precedence. For all of her desire and intent, Klein simply lacks the tactical knowledge and foresight that the Doctor or another Time Lord may employ for such a massive temporal undertaking. Yet because of her meddling, everyone around her has changed, the Doctor included. Thus, the man locked within the base’s prison is not the Doctor with whom Klein has been traveling, though neither is he a parallel version given free reign in this universe with no threat of consequences. More intriguing, however, is the fact Lyons crafts a means for the consciousness of the Seventh Doctor from the true timeline which Klein diverted to assume control of his body on the base. It’s wonderfully complex, but the payoff with the continuation of the developing relationship between Klein and the Doctor is incredibly rewarding as events steer toward their climax. In fact, the original Doctor taking control in the middle of one of his other self’s master plans, having to figure out his plan with the attacking Salachians as he goes along, is a very strong conceit and shows once more just how manipulative and clever this incarnation is. What he fails to take into account, however, is the potential presence of a new companion in this timeline, and he is thus completely unaware of Rachel Cooper. Lenora Crichlow gives a powerful performance as this one-off companion, labouring tirelessly and faithfully to knowingly bring about a timeline in which she may never meet and travel with the Doctor. The speech she gives about potentially not getting the chance to truly live as a result is particularly harrowing, and the impending sense of tragedy and empathy is truly impressive given that this character is a completely new one. Because of the complexities of the script, however, the Salachians don’t get as much time to breathe and develop as may be expected for a new audio foe. This race, of course, was introduced in Lyons’s own BBC novel The Final Sanction, but their backstory is rather ignored to focus on the story at hand. Still, the sound effects to bring the armoured shark-like beings to life is suitably impressive with fitting aquatic undertones. Also boasting an impressive guest cast that includes Jamie Parker, Ian Hayles, and Lloyd McGuire as fascinating members of the moonbase staff, every performance is riveting from beginning to end. 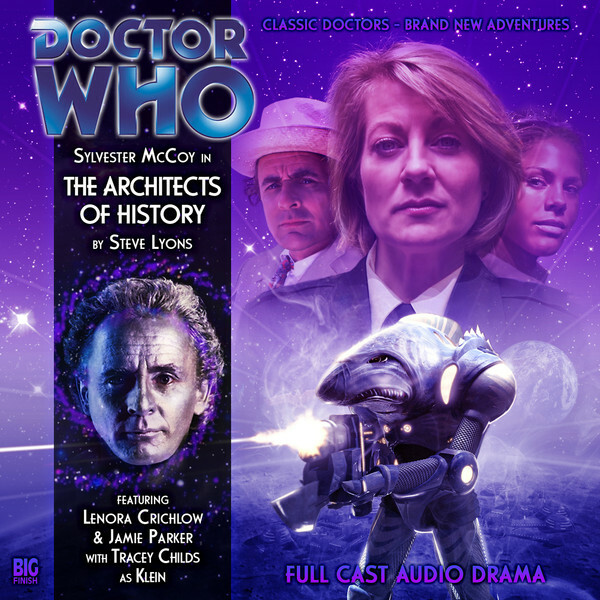 ‘The Architects of History,’ then, manages to wrap up this very long-standing storyline exceedingly well. While the ending may be a little convenient, the final emotional scenes between the Doctor and Klein as the Doctor must accept responsibility for his own actions head-on are wonderfully nuanced and poignantly delivered. He sets out what he originally intended by ‘curing’ a Nazi, but the examination of contrasting philosophies along the way makes the journey to that point all the more rewarding.